Yesterday, was all about reviving your body from the party slump. If you’ve had too many late nights and way too many parties, here’s how to get the glow back in your skin. Winter has genuinely been hard on my skin and I keep going back and forth to find the perfect permutations and combinations that suit my face. These are personal favourites leaning towards catering dry skin or oily skin with dry patches (like mine). Nothing affects skincare as much as cleansing does. I start removing my makeup with my Elemis Pro Collagen Cleansing Balm and a flannel. This is the perfect step for starters. It leaves my skin hydrated and cleansed. 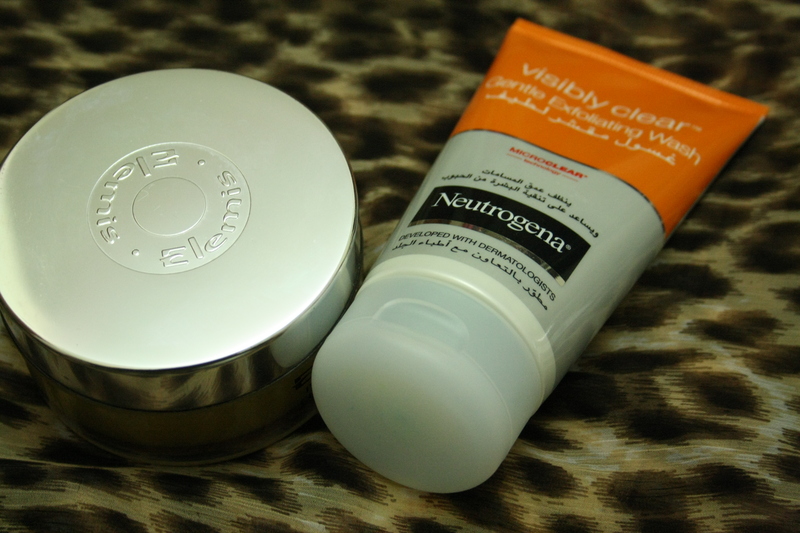 But, if I am wearing no makeup, Neutrogena’s Visibly Clear Gentle Exfoliating Wash is my go to. Although, I’ve heard facial washes can alter the PH level of your skin, this particular one has been the deal-breaker. It has never dried out my skin and the micro exfoliants are very gentle for my skin, not abrasing existing dry patches. I’ve used Elemis for 2 months now and could not say any better things about this. I will be reviewing this completely later on my blog. And Neutrogena has been in my skincare for 3 weeks now and has just improved the quality of a quick cleanse. This one also will be reviewed in depth later on. DIY Option: As some of you prefer DIY options or would not want to spend a whole lot on you skincare. Just use baby oil with a cotton pad. It will take the gunk out and if kept on skin for 5-10 minutes, will act as a great moisturiser as well. Moisturise: This is usually the part I put my face above a steamer and let it open my pores before diving in skincare. After which, I will use my Olay Regenerist Serum. Mind you, I am 21 and this still does wonders at improving the quality of my skin. Also, I believe I would prefer to use anti-ageing products now to prepare my skin for ageing beforehand. I love this serum and will talk about the entire line, another day. Followed by a thick moisturiser like Embryolisse creme concentrate. Again, a staple for 5 months and love it to bits. However, if I use this in summer, this cannot go under my makeup, so beware. I know makeup artists rave about this product as a primer, but its a bad idea for combination skin-types (even with dry patches). Miscellaneous: If my eyes are feeling particularly dry, I do use my Olay Regenerist serum. Personally eye cream is just not my cup of tea (bad, I know!). At Christmas Eve, you will find me doing all this with an extra cherry on top. That is my Ren Glycol Lactic Radiance Renewal Mask – Just love this baby. See my complete review here . Also, If I am going to be doing my makeup, I will be using Guerlain Blanc De Perle base. It is my favourite, even more than Laura Mercier. It instantly brightens my face and works like magic. Perfect primer. Hope you enjoyed this! Let me know in the comments below if you tried any of this! Please do a review on the Olay serum! 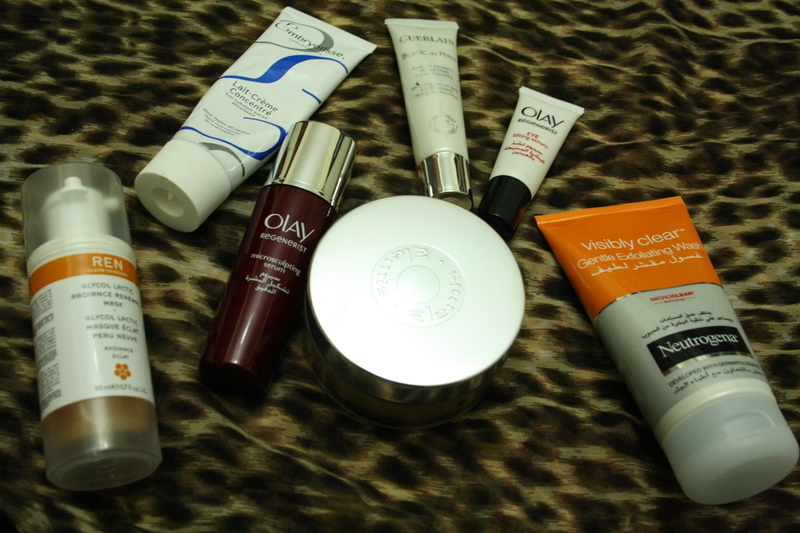 Yes, and you should try the Olay Regenerist Night Renewal Elixir, its great! on a daily basis. It’s always helpful to read through content from other writers and use something from their websites.